Your walkways, the exterior walls, patios, and driveways collect dirt and debris over time. Leaves, sticks, mud, sand, grime, dust, and other types of dirt fill the joints of your paving. Vegetation such as mildew and grass may start growing on the paving causing immense damage to the area. For all this and more, we have a professional, cheap, and experienced high pressure cleaning in Sydney cleaners to handle any type of surfaces and leave them looking good. The cleaner scrub, clean, and wash all and any type of surfaces including fences, driveways, patios and the walls of the building. Regular cleaning carried out any cleaner may hold good for some time. However, over time, you may notice that grime cakes on the surfaces. Removal of grime is the specialty of our high pressure cleaning in Sydney service. The cleaners from Franklean Carpet & Tile Cleaning are experienced and have the know-how and we extend our services to anyone residing in the North Sydney and Sydney CBD areas. Professional pressure cleaning Sydney makes use of a high-pressure machine, cleaning detergents and a jet washer to ensure fresher and cleaner outdoors. If the surfaces are very dirty, we use a washer and a high pressure cleaner to help wash, clean and dislodge the dirt. The water passed through a high-pressure jet gets rid of any dirt especially on the edges of the paving and ensures that it looking clean. 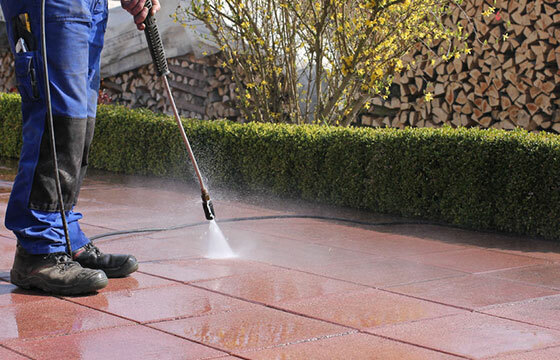 Why is outdoor pressure cleaning important? When our cost-effective, cheap high pressure cleaning in Sydney cleaners have cleaned the outdoor surfaces, they will look brighter, clean and you will have added more years to your property’s lifespan and will have eliminated elements that are to blame for the decay, rot, and corrosion of materials used outdoors. Consider hiring a cleaner and washer for high pressure cleaning and washing service at least once a year. Having it cleaned on a timely basis, will keep your structure in good condition and it may increase the price and resale value of your property too. In Sydney, we experience severe weather patterns that range from high temperature, cold winters, and high humidity levels due to its closeness to the ocean. There is also increased rot on the surface caused by organic matter originating from the trees and acidic rain. With all these elements settling down on your property exteriors, regular pressure cleaning is the way to go. Our cost-effective, cheap, residential high pressure cleaning cleaners specialize in helping clean lawn equipment, mobile homes, composite decks, fences, patio furniture patios, and poolside, sidewalks and driveways as well as the house slidings too. High pressure cleaning Sydney service handles a variety of surfaces including cedar, stucco, aluminum sliding, hardiplank, fibber cement stone facades, wood sliding, metal sliding, brick, and vinyl sliding among others. On the other hand, if you want an emergency high pressure cleaning at any time, never hesitate, and just contact us anytime, even if it were an emergency of any sorts. Our commercial high pressure cleaning services can get the fast food drive-through, bank drive- through, parking lots, sidewalks, and storefronts among other areas cleaned well. If you want an immediate, emergency high pressure cleaning and washing in Sydney, we can get it done. The cleaners from our cleaning services company Franklean Carpet & Tile Cleaning will help clean, wash, and have the outdoor area cleaned thoroughly even at short notice. And most of all, the price for a pressure cleaning in Sydney, is cheap and reasonable. And if you reside in the North Sydney or Sydney CBD areas, then we cater to these neighborhoods too. To know our price or for any other query regarding regular and emergency cleaning service, contact us on 0411 181 990 or email us at frankleansyd@gmail.com.